*Regular cost is based on the average of the 80th percentile usual and customary rates as detailed in the 2018 FAIR Health Report in the Los Angeles, Orlando, Chicago & NYC metropolitan areas. **These fees represent the average of the assigned C500 fees in the Los Angeles, Orlando, Chicago & NYC metropolitan areas. All questions are personally answered by a dentist with most responses to questions arriving within a few short hours. Members can get questions answered, make better decisions and live healthier with eDocAmerica. This plan is not available in VT & WA. GC: C50017. Save 20%-60% on routine dental procedures with our most popular plan. The Careington 500 Dental Savings Plan is our most popular offering of affordable, easy-to-use discount plans. Members save an average of 20% to 60% off the standard fees of dental procedures, such as routine exams, adult and child cleanings and root canals. In addition to standard procedures, this discount plan features 20% off of orthodontics, including braces. Discover what thousands of members already have, and start saving with your own Careington 500 Dental Savings Plan today! Click a tab below for more product information and savings. 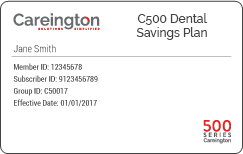 After I join the Careington C500 Dental Savings Plan, when can I start using it? You can use the discount plan and start saving right away! Your membership kit will be mailed to you after you purchase the plan; however, if you call our Member Services Department at (800) 290-0523, they can provide you with your member ID number, which you can present at one of our many participating dentists in our nationwide network. How can I save money on braces? When you purchase the Careington 500 Dental Savings Plan, you receive a 20% discount on orthodontics, including braces and retainers for children and adults. How much is a dental cleaning? On average, an adult dental cleaning costs $126.00*. However, with the Careington 500 Dental Savings Plan, you can save over 60% on the regular cost and pay an average of just $39.00** per cleaning. What's the average cost of a root canal? Typically, a molar root canal costs $1,382.00*, but members of the Careington 500 Dental Savings Plan pay an average of just $508.00** per root canal. That's a savings of over 60%! ** These fees represent the average of the assigned Careington Care 500 Plan fees in the Los Angeles, Orlando, Chicago and New York City metropolitan statistical areas.